P.S. : I apologize for any confusion that I may have caused. The eighth annual Parcours des mondes, one of the world’s leading international tribal art fair, will take place in Shops around Saint-Germain-des-Prés from September 9 to 13, 2009. 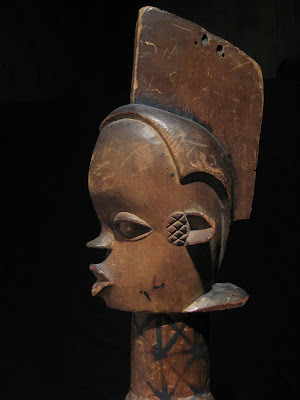 (The Dealer’s Eye: A Passion for Tribal Art) at the Monnaie de Paris, near the rue Guenegaud, 11 quai de Conti, Paris. The eighth annual Parcours des mondes, the world’s leading international tribal art fair, will be held in the Paris historic Saint-Germain-des-Prés from September 9 to 13, 2009. Parcours in prestigious spaces that normally specialize in modern and contemporary art and design. The rigorous selection of participating dealers, together with their discerning expertise on the exhibited objects, will guarantee a top-quality experience for the visiting public. A unifying theme will characterize the 2009 Parcours des mondes, that being the figure of the dealer as a discoverer, educator, expert, and devotee. Dealers are the intermediaries who aid both the beginner and the longtime collector. They contribute both to private and public collections, not only by offering high-quality pieces, but also with their expertise. This show, which will be full of surprises, will emphasize the key role of the dealer through a selection of the most beautiful pieces placed in collections by the participants of Parcours des mondes over the course of their careers. The exhibition will open its doors on September 9, 2009 at the same time as the Parcours, and will run through October 18, 2009. Accompanied by a richly illustrated catalogue and an international symposium on the same theme, this new style of exhibition will complete the Parcours, which will once again open the eyes of the public to exceptional arts. See some images from dealers with African Art at Eurantica Some fine items on view. I will participate next month to the Eurantica Fair in Brussels. I also launched the African Art Club fo those of you who want more insiders informations.